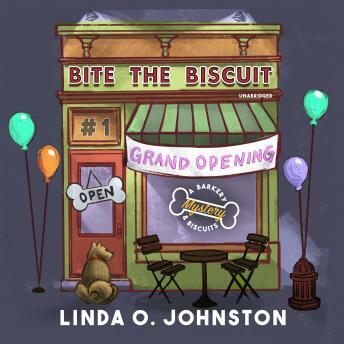 Listen to "Bite the Biscuit: A Barkery & Biscuits Mystery" on your iOS and Android device. Carrie Kennersly, a veterinary technician, has become known for baking healthful and popular dog treats at the clinic where she works, in the town of Knobcone Heights, California. When a friend moves away, Carrie buys her bakery and converts half into a Barkery to sell her canine delights. Carrie even works things out for her beloved rescue dog Biscuit to hang out in the dog part of the enterprise. But Myra and Harris Ethman, who own a local store selling pet products, hate the new competition-and they're members of one of the town's most elite families. After publicly badmouthing Carrie and antagonizing family and other townsfolk with her big mouth, Myra is found dead with a Barkery biscuit beside her. Now Carrie must prove she didn't consider the rivalry, nor Myra's nasty criticisms, a sufficient motive to commit murder-before she's collared for the crime.